Zombie Outfitters: Any Need for Zombie-specific Marketing? Recent rumors and news got me thinking: Do we really need to have zombie-specific merchandise? There are now at least three blaster companies reported to be involved with making zombie-hunting blasters. Let's take a look at the notable releases. 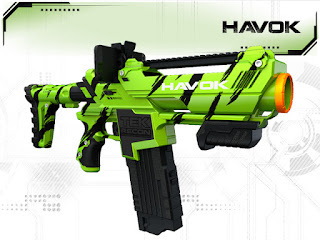 Toys R Us sells HvZ blasters -well, one HvZ blaster. They're really Air Zone blasters with a paint job. I was a bit annoyed by this. Air Zone is generally a miss for quality blasters. It's not like that should come as a surprise. So when Gnarwhal studios (the original HvZ folks from Goucher College) went with Geoffrey to do their official blaster line . . . it was sad. Doesn't seem they were so successful either. If you look at this as a way to support the original guys that started Humans vs. Zombies, I guess that might be something. But you'd think people who are trying to make a business would go with more quality. 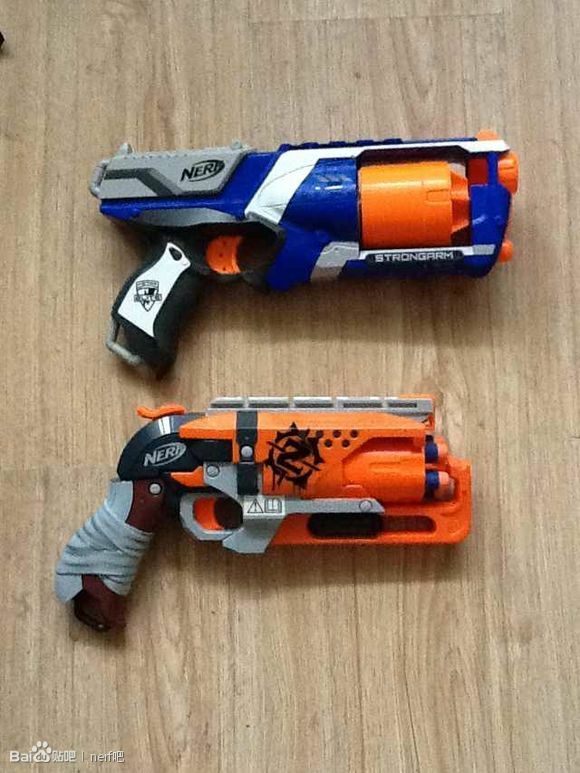 Rumors with pic spam have started circulating about a "Zombiestrike" blaster. A user called yayaccav, posted pictures and then a video. 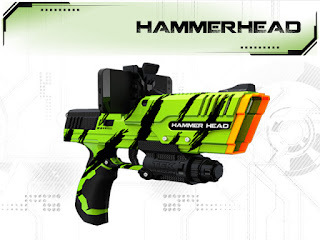 The "Hammershot" has been attributed to NERF and has the logo on it. Doesn't look like a mod or hack. Actually, it looks like an alternate version of one of the new Rebelle blasters they are releasing (marketed to girls). The Baidu pics and video have since been removed. Some of my fellow NIC bloggers found a state-side video too, if you care to look. Nothing has been confirmed. Please keep in mind that this is still unofficial. I would not recommend promising money for this blaster to any retailer or third party seller yet. If this blaster is confirmed, this will be one of the coolest sidearms. Looks like it will operate much like a wild west six-shooter, or . . . five-shooter. Even if it is a NERF Rebelle repaint, I don't mind if they release it within the season as an alternated for those who don't necessarily want pink. 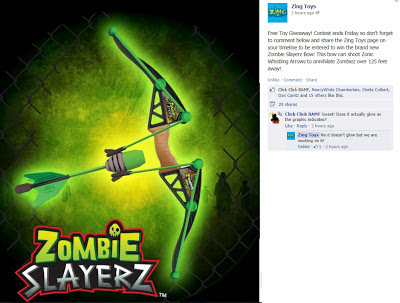 Zing Toys seems to recycle their famous Z-Curve bow with other branding like Air Huntress (a pink version) and now Zombie Slayerz. I don't necessarily take issue with that. Especially when they say they are working on a glowing version! A consistent and quality product that can hit 125 foot ranges can re-release as many copies as they want! Keep in mind that HvZ Goucher-style (original+) rules specify that a hit shouldn't hurt. Be careful using the bow, if the moderators allow it. I'd like to see a Hawkeye look-alike picking off zombies with a bow! That just sounds fun. One of our contributors won the recent Zing Toys contest, so we'll be looking at this beast soon. Great news for the folks at Tek Recon; They've jumped to 38% funded on kickstarter. Looks like they've found one of their 5,000 dollar backers. Wondering about the firing mechanism in the Tek Recon blasters? 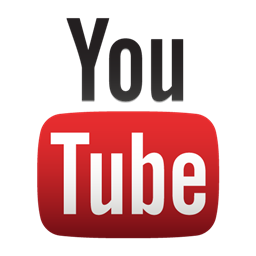 Tek Recon now has a third video update out to show you what's up. Remember to check out their kickstarter page! Q: Tek Recon. What made them choose that name? Is it meant to sound military -like Force Recon? A:WE LOVE THE IDEA OF "RECON" AS IN RECONNAISSANCE WHICH IS VERY NECESSARY WHEN PLAYING WITH FRIENDS (ESPECIALLY WITH CAPTURE THE FLAG). ALLOWING BLASTERS SMARTPHONE ENHANCEMENTS WITH "TECH" FEATURES MAKES THE RECONNAISSANCE THAT MUCH BETTER AND MORE "VIDEO GAME-LIKE". ITS ALL ABOUT THE GAMEPLAY. FUN RECONNAISSANCE THAT WE ALL LOVE, IN REAL LIFE WITH VIDEO GAME-LIKE ENHANCEMENT. Q:-Some readers/viewers are asking me about the company location. The kickstarter reads as from Canada. The shipping costs more anywhere outside the US. One particular viewer was excited about the design team being in his country, but curious about the shipping issue. Is this just due to where manufacturing will happen etc? A:WE'RE A CANADIAN COMPANY WITH A US OFFICE. WE'RE SHIPPING MOSTLY FROM THE US HOWEVER WE WILL HAVE SOME STOCK IN CANADA THAT WE CAN SHIP OUT (FOR THE COMMAND PACK FOR EXAMPLE). Tek Recon Power-Ups: Foam/Rubber Drone Attack? At last check, the Tek Recon kickstarter was funded up to around 27% - make that 28% and still has 25 days to go! Tek Recon got back to us today regarding that hanging question about their apps. Doesn't sound like they are expecting contributors right now, but we did learn more about the power ups! Foam/rubber drone attack anyone? Not really, but on the screen! LOL! Q: They talked about power-ups in the video. Will those be something you can program and print for scanning or that they want you to buy? Will they allow other developers to design and contribute scannable QR codes et cetera? –Drone Attack: While an opponent shows up on radar, if you enable this powerup and click on their blip before it disappears it sends a drone attack and removes them from the game. Click too late and the drone misses. –Wire Tap: Enable this powerup and open up communication with the opposing team. Can talk to them and hear their messages for 1 minute. -Disable Flag: disables anyone from scanning your flag for 20 seconds"
A few people have already been asking if I think this will mimic COD: Black Ops perks. I don't think you'll be seeing things like "flak jacket" and "hardened" manifest in the game. "Ghost" (or Invisibility) is doable because you could just be taken off the HUD -in this case for 45 seconds. Here is some of the earlier information we learned about the app. Be sure to visit the Tek Recon kickstarter to learn more and to contribute! Create your own Profile by selecting a Username and Avatar. 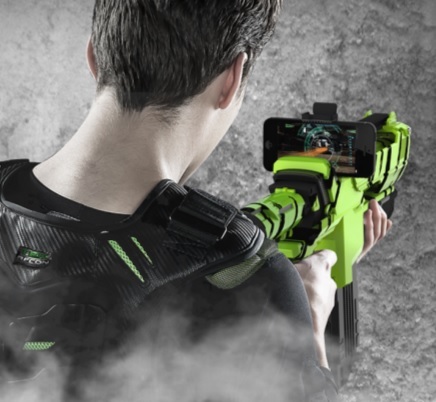 Armory to control and create game loadouts, including your blaster, scope, sound effect, and in-game powerups. Familiar multiplayer game modes including Isolation (every man for himself), Team Supremacy (team battle), and Capture the Flag (with flags you scan when captured). Radar which reveals teammates, as well as opponents. 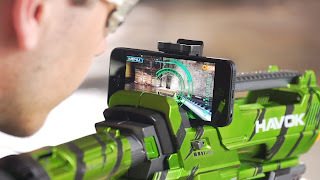 In game features such as live chat, on screen ammo counter, simple swipe vision modes (Classic, Night Vision, Heat Seeker, X Ray), quick tap zoom + many more. Zing Toys working on Glow-In-The-Dark bow? So in case you missed it, Zing Toys is doing a facebook giveaway. You can qualify until Friday. When they posted it, I asked about the graphic. It looks like the bow is glow-in-the-dark by the way the graphic is designed. That isn't the case, but Zing gave a hint that it may be in the works! Just an update since I mentioned it in the earlier article. Thank you for contacting Frito-Lay. We are pleased to know that our company and snacks are of interest. As you might expect, Frito-Lay receives a tremendous amount of product donation and sponsorship inquiries for many worthwhile causes. Although we would like to meet these requests, it is simply impossible for us to honor each one. Please be assured that we realize the tremendous benefit that groups such as yours represent, and we sincerely regret that we are unable to participate. Thanks again for your interest in Frito-Lay. Any ideas on other companies you'd like to see snacks provided by for an epic water fight! A few days ago, we were turned down by the folks at houseparty.com to host a Super Soaker Block Party. It's not like it stopped us from hosting our own party -which happens on June 1st. Got to say it kind of sucked being turned down to do the thing we, as a company, are built to do. Example: check out our pic spam blog of the new Super Soaker products on shelves! Not only that, but the application process was screwed up and House Party's tech support failed at life. I don't know that we'll be trying again in the future with that particular company. That's not because we were turned down -there are parameters that a company like that and the sponsors agree to. We may have just not fit the profile. It's because of their lack of support and their ineffective communication. Our friends at NERF are awesome enough to support us in our own party and we'll have the bigger blasters around thanks to that. 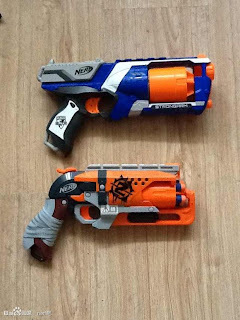 So warriors, expect our debut of NERF Super Soaker Reviews near June 1st. If you are in or near the Colorado Springs area, feel free to join us. We're be at a local park. Check the event out on facebook! What do you think would make a great Super Soaker party? BTW, we also decided it was worth a shot to see if the Frito-Lay company would go ahead and support us too. They don't generally take requests for sponsorship. So, we'll see how that turns out. Well, Sunday morning and the kickstarter is sitting at just over 15 percent of goal with 28 to 29 days left. We're already getting some answers from the PR folks at Tek Recon. They were cool enough to answer most of our questions on a weekend. I will post the answers in italics. Refer back to our previous article for more background on the concerns. 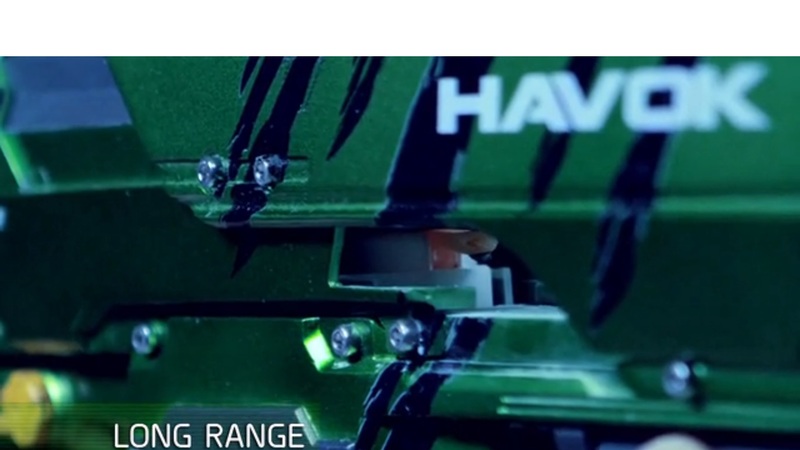 Right off the bat, there is a reason behind some of the perceived damage to the NRG rounds: The footage in the video is from much earlier prototype and NRG Rounds that were pre-product. The production NRG Round hold up much better and will last a long time. They assure us that the actual product is ready to rock! Once you see the production NRG Rounds you will feel very confident that they are designed and manufactured to endure multiple use at any setting on our blasters. The product functionality is exceptional. As you know, we asked about price for the replacement rounds too. Price will range by retailer, but there will be multiple packs ranging from $7.99 and up depending on quantity. Now on to the app questions. The app is apparently not going to track hits. You can see how that might be difficult to track what physically hits in an app. No the app is meant for GPS Team Play and to track your opponents. Really excited to see how GPS tracking will work in the heads up display. For the question I posed about other developers working on power-ups and such, they'll get back to us on that one. This past week brought the launch of an innovative kickstarter listing. Tek Recon has launched a 31-day bid to get $50,000 in crowd-funding from users of the famed kickstarter website. As I write this, they have 30 days left and are just over $6,100 on their way -a little over 12 percent. President and CEO Brad Pederson says that this move is their most ambitious in company history. That makes sense, considering that it's time to put these things on the shelves. I, for one, am very excited to see where this effort goes. Will this be that successful way that so many health professionals have been looking for to get kids off the couch? Campaigns have worked mildly recently, but there is not a massive appeal for those who would rather play Black Ops. Some folks will still not be happy because the game will still involve computer screens in the form of smart phones and other devices. Is this the next step in gaming? Google glasses came out recently. I dreamed of a foam blaster or airsoft game where you could use those glasses for objectives and power-ups. Perhaps this is the step just ahead of that. A geek can dream! At this time, the app is free that they offer to integrate a real-world blaster with online gaming. If they keep the prices for Hammerhead and Havok blasters at 25 and 40 dollars after the kickstarter promotion, I won't accuse them of overcharging to make the app "free" either. The app is exciting because of their promise of the use of GPS and the heads-up display. If you can set objectives for the app to help you track, perhaps it can include both game objectives and physical activity goals? There are a lot of positive notes for this launch. Ultimately, I am all for it and will back the project too assuming I have the funds. Yet there are several questions left to answer as we move forward. If you take a look at the video on kickstarter, there seems to be damage occurring to the NRG rounds as they build their "kinetic stretch energy" to fire. If you look closely at this shot in the video, particles of . . something are falling from the blaster after the round launches. Tek Recon says on kickstarter that the rounds are reusable, does that hold true and for how long? Also, how much will the refills actually cost? Keep in mind, this shot is from a demo of the long range setting. They've indicated that you can modify the range with a setting. Perhaps sacrificing distance will preserve your ammo? Back to the app questions: Is this app meant to track if you get hits? I (and other journalists I showed the video to) skeptical of the usefulness of the app for tracking hits. I personally came away with the impression that it could be meant to function that way from the cup shooting demo in the video. Perhaps it was a misconception. Either way I am geeking out to give it a try! I am also super-curious about further app development. They talked about power-ups in the video. Will those be something you can program and print for scanning or that they want you to buy? Will they allow other developers to design and contribute QR codes et cetera? Hey Warriors! Just posting up the last couple of reviews. Been meaning to keep up on that! Just below is the most recent review from Coop in the West Coast division. I love the title -Double Barrels of FAIL! Take heed to his warning about the quality. Here is a better shotgun attempt. Of course, this one would be from the folks at NERF.